This past Saturday, 22 December 2012, was the Christmas present that Daisy gave me. What that means is that for Christmas I got to spend one day, all day, birding, while we are in southern California staying with relatives. I made the most of it, meeting up with Seagull Steve, the frequent birding companion of 10,000 Birds Beat Writer Felonious Jive. We had several target species for our trip but none were more important to both of us than the juvenile Gray Hawk hanging out along the 101 Freeway in Santa Barbara County. It was first found on 25 November by Eric Culbertson and it is a state first for California which is pretty amazing considering how many species are on the California state list. Steve needed the bird for his state list, having already seen them in Arizona. I had never seen a Gray Hawk. Both of us hoped to find the bird, watch the bird, enjoy the bird, and put satisfying marks next to Buteo plagiatus on our respective checklists. Regular reporting about the bird had for some reason ceased on 19 December and we were worried that the lack of reports meant that the bird had disappeared, though we also theorized that most California listers had already been to see the hawk and the initial mob of birders had dwindled to a trickle. Steve had looked for the bird the day before our attempt without success though, so we were steeling ourselves for a dip. But when we approached the exit off the 101 that the hawk had been spending its time around I had a feeling that everything was going to be alright. 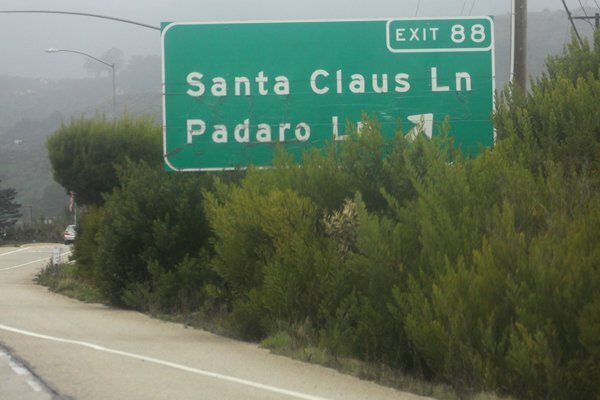 After all, in the holiday season you just can’t dip when you are birding on Santa Claus Lane, can you? Really, the hawk had been hanging out at Santa Claus Lane? How insane is that? We were even more encouraged by the buteo we saw perched on a power line with its back to us on the east side of the highway. But our confidence level dropped significantly when we got to where the bird had been only to see nothing but a cyclist pedaling past. The bird had apparently been flushed by the cyclist. After preventing Steve from swerving off the road to put an end to the bird-flushing habits of the cyclist we made our way back to the other side of the highway, on Santa Claus Lane itself, and searched for the bird. No Gray Hawk showed itself. Now, we still had a bunch of birding left in us. We had a couple more spots to visit and target birds to see. So we reluctantly went on our way after about forty minutes, planning to stop to look for the bird on our way back, provided that we saved enough daylight to make the attempt. Luckily, we did. 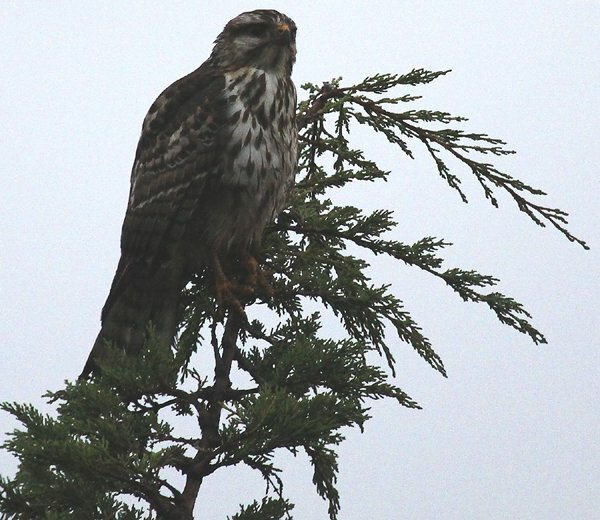 And this time when we pulled off the highway and slowly drove Santa Claus Lane I spotted a buteo that looked heavily streaked on its chest as we puttered along. Steve stopped, put the car in reverse, we raised our optics, and YES! The celebration was intense and awesome and brief as the bird did not stick around to congratulate us on our perseverance and persistence. Nonetheless, we were we pleased. It was my third lifer of the day, bringing me to 499 in the American Birding Association area, and a fine example of what is a pretty striking hawk, for a juvenile. If you go to see the bird you could do worse than avail yourself of the resources linked in this post. It was an epic blitzkrieg of holiday birding. Gray Success. Great Success. That it was, Seagull Steve, that it was. Thanks again for being an awesome birder, driver, and guide. And for not letting me get carried away with McCown’s Longspur fever. I still think one could have been in there, but thats a bird that requires some good looks. Some other good birders came a day or two after us and also reported 3+ CCLOs though, so perhaps it was best to stifle the fever. Great to finally get to bird with you.